Salmon is very rich in B vitamins and omega fatty acids making it a heart-healthy protein option for your dog. Omega oils also help prevent skin problems. Salmon, Pinto Beans, Hemp Hearts, Carrots, Coconut, Pumpkin, Kale, Blueberries, Turmeric, Vitamin A Supplement, Vitamin D3 Supplement, Vitamin E Supplement, Niacin Supplement, Iron Proteinate, Calcium Carbonate, Phosphorous, Zinc Proteinate, Riboflavin Supplement, Thiamine Mononitrate, Potassium Chloride, Manganese Proteinate, Copper Proteinate, Magnesium Chloride, Pyridoxine Hydrochloride, Vitamin B12 Supplement. 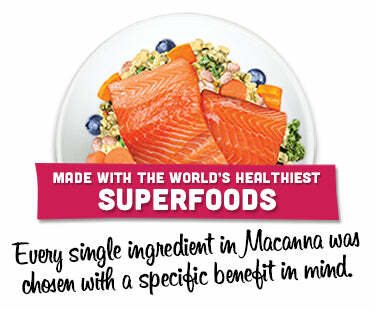 Grandma Lucy’s Macanna Salmon Recipe is formulated to meet the nutritional levels established by the AAFCO Dog Food Nutrient Profiles for All Life Stages.